Vladimir SAMSONOV has won his 27th ITTF World Tour at the Seamaster 2017 ITTF World Tour Platinum Australian Open which concluded today 7 July 2017 on the Gold Coast, Australia. Day 4 action from the 2017 Australian Table Tennis Open, a round of the 2017 Seamaster ITTF World Tour Platinum. The evergreen 41-year-old extended his lead on the top of the ITTF World Tour wins over MA Long, who sits on 24 World Tour titles. SAMSONOV’s 27th title also means that the Belarussian is the first ever player to win an ITTF World Tour event on every continent. SAMSONOV defeated Simon GAUZY (FRA) who on the other extreme was appearing in his first ever ITTF World Tour Final 11-13, 11-8, 11-5, 11-8, 11-8 to clinch this historic title. 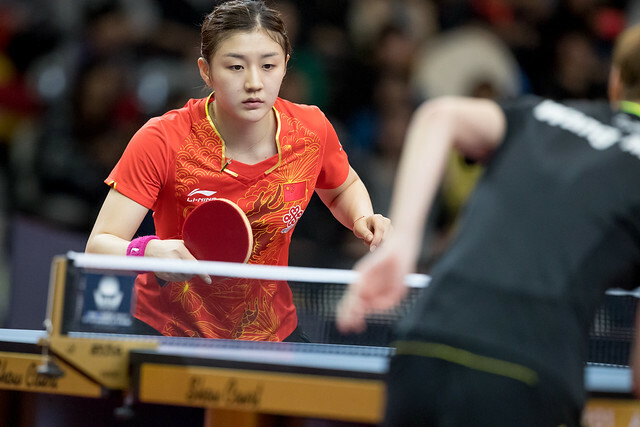 Chinese CHEN Meng won her second ITTF World Tour title in 2017 by defeating her younger team mate, two-time World Junior Champion WANG Manyu 3-11, 12-10, 3-11, 12-10, 11-2, 11-7 in front of the sold-out crowd. The Korean pair of JANG Woojin & PARK Ganghyeon were too good for the Chinese Taipei duo, of CHEN Chien-An & CHIANG Hung-Chieh, beating them 11-2,11-13,11-5,11-6 to clinch the men’s doubles title. Women’s singles champion CHEN Meng & her partner ZHU Yuling won an all Chinese women’s doubles final over their colleagues CHEN Xingtong & WANG Manyu 11-8,11-9,11-7 to the delight of all their travelling Chinese supporters. The world’s best players now have some time off, returning to action at the Seamaster 2017 ITTF World Tour Bulgaria Open on 17 August 2017.